I have some super exciting news! I have the honor of joining the Paper Craft Crew Design Team! I'm thrilled to join such an amazing group of Paper Crafters! 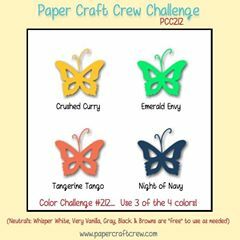 I hope you'll check out the PCC challenge and link up a card of your own! Just pick any 3 of the 4 colors for your card! 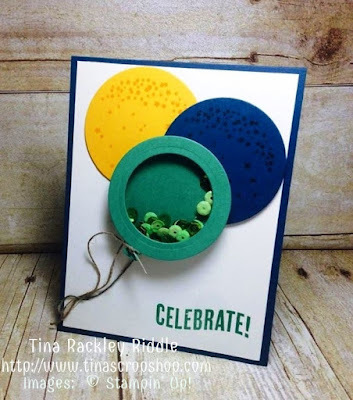 I decided to go with Crushed Curry, Emerald Envy and Night of Navy for a simple Celebrate Today Balloon Shaker Card. For my card I started with an 11" x 4 1/4" piece of Night of Navy Cardstock, scored at 5 1/2". On a piece of Whisper White Cardstock that measured 4" x 5 1/4", I stamped in Emerald Envy the Celebrate sentiment from the Celebrate Today Stamp Set on the lower right side. I then cut out Balloons with the Balloon Framelit Dies in Emerald Envy, Crushed Curry, and Night of Navy. I stamped the Balloon bubbles tone on tone on the Crushed Curry and Night of Navy Balloons.. seriously I have no idea what you call the stamp I used but I call it balloon bubbles. LOL I glued my Crushed Curry Balloon directly onto the White Cardstock layer. I attached the Night of Navy Balloon with dimensionals on the right side to layer onto the Crushed Curry Balloon. In the Emerald Envy balloon, I used one of the layering circle framelit dies to cut a hole inside of it. I then used another of the layering circle framelits to cut a back that was bigger than the opening, in the Emerald Envy for the back of the shaker. I cut out another circle in between the two sizes in a Window Sheet. I used foam adhesive strips to attach my window sheet to the back of the balloon front. I doubled up another layer of foam strips on top of that to give my Doodlebug Limeade sequins plenty of room to shake around. Next I added my sequins to the balloon shaker and then attached my balloon back. I then used Multipurpose glue to layer over my other two balloons. I attached the twine to the bottom of all of the balloons by tying a little knot and then used some Ranger Multi Medium Matte to attach the twine where they met at the side of the card layer. The great thing about the Multi Medium Matte is that it glues matte so it isn't shiny or sticky once it is dry.